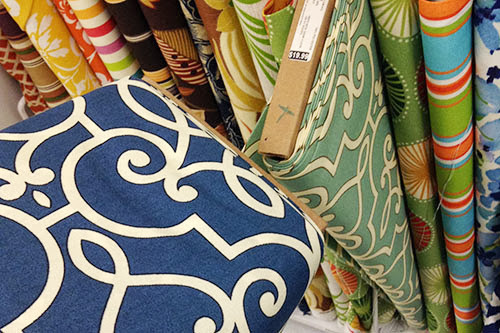 Now, any time I walk into a fabric store, I have a hard time not getting distracted by all the patterns and prints and textures. But when it’s all on sale? Forget it. I’m done. Poor Mr. P, who had volunteered to go with me for this ONE THING REAL QUICK, kept turning around to find me stopped, staring at the fabrics. And perhaps most oddly... touching them. Yes. 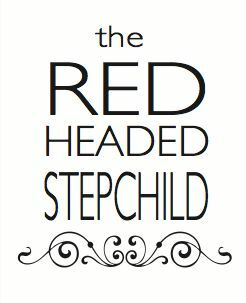 I do that. 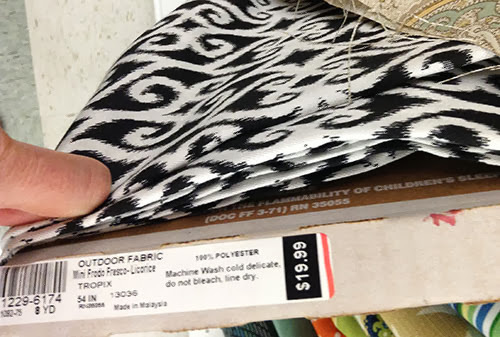 As a matter of fact, I love just standing and taking in the colors and patterns so much that I promised myself I could go back and look at all the sale fabrics if I got all my work done at a reasonable hour. 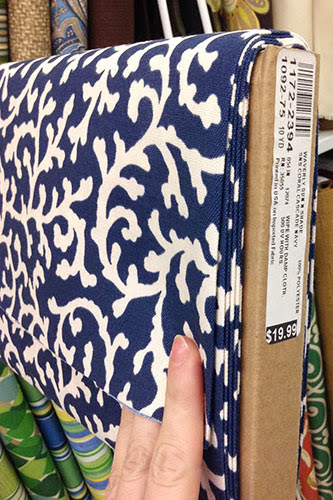 I don’t know what it is, but having the chance to leisurely peruse bolts of gorgeous fabric is like therapy. Some people take bubble baths and read magazines. 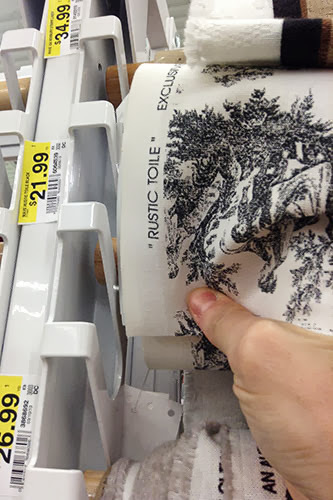 I paint all my trim and browse fabric stores. Everyone’s gotta have a way to relax. 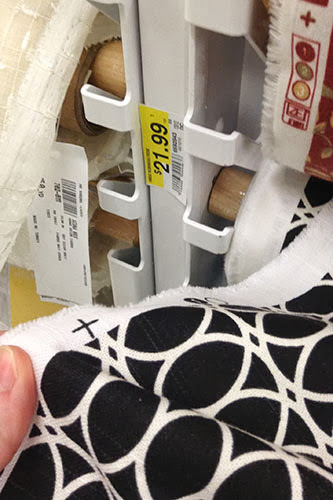 Note that whenever I take photos in fabric stores, I try to get my hand in there (for pattern-size perspective) as well as the tag or some identifying information, so I know who makes the fabric if I decide to look it up later. This one’s apparently made by HGTV. Ten bucks a yard, people. I love it, but I’m still not sure where to use it! Curtains? Pillows? I just don’t know. I know I didn’t capture most of the pattern in the photo... sorry. Plus, the label was missing (the “Robineau Rose” on the tag is referring to the bolt above it), so I don’t know who makes this fabric. I do know it makes me want to be a little bolder with black and white in my decor! I’m also digging but fearing large-scale florals. 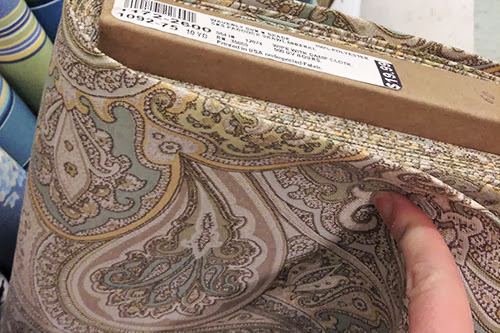 This fabric (by Richloom, I think?) looks like it’d make fantastic curtains... but fantastic for my house or an elderly lady who hasn’t decorated since the 1970s? I’m not sure. No hand for perspective, but believe me, the print is huge. Hmmm. 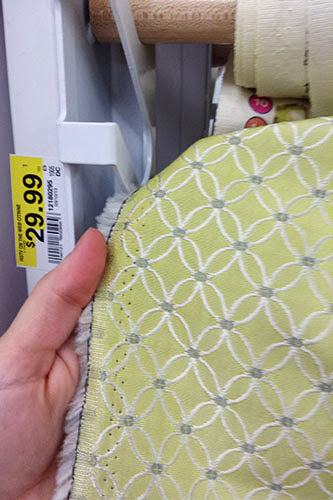 And although it’s not quite a print trellis, I carried around this bolt of half-anemone, half-trellis fabric for awhile just because it was so pretty. 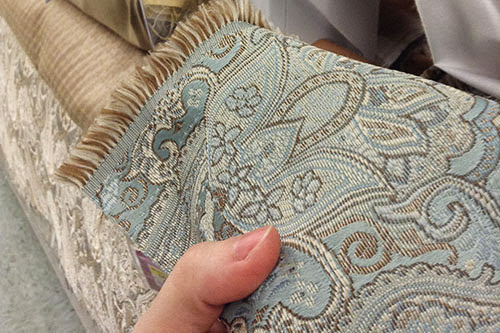 Ohhh my gosh, I could look at fabrics all the live long day. Although I spent a ridiculous amount of time simply wandering around and looking and touching all the fabrics, I did actually buy a print or two. Any guesses which ones? 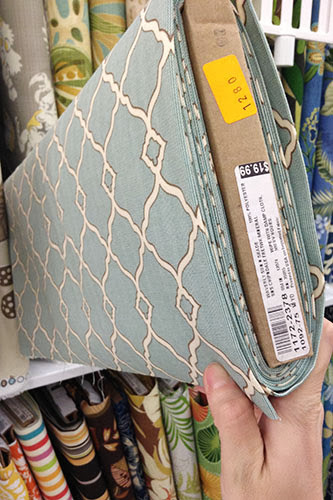 And until I have a chance to share a new fabric project, I hope you at least got a bit of fabric store therapy. 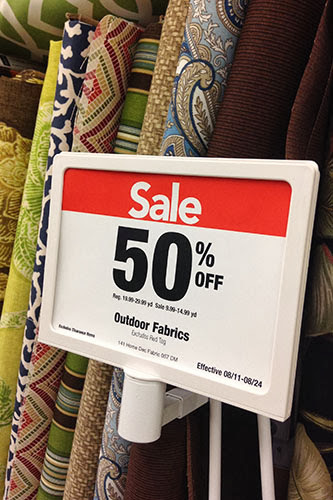 Or better yet, I hope you have a chance to experience real-life fabric store therapy before the sale ends! 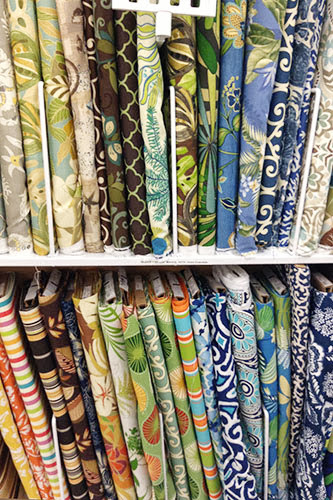 I love wandering through fabric stores, and it always makes me want to learn to quilt. Haha. I love the fabrics you posted. The first citron/gray print is amazing, and might be just the pop of color that my gray gray and more gray living room needs. Concerning paisley and large scale florals, I think they can look incredibly chic and modern when paired with the right things. 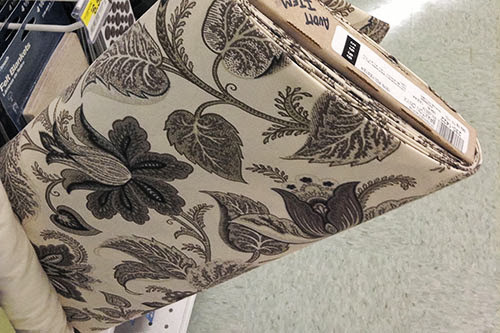 Both patterns in the same room might be a bit much. But using them as pops and interest in rooms that are full of geometric, solid and modern textiles, I think it would be amazing.